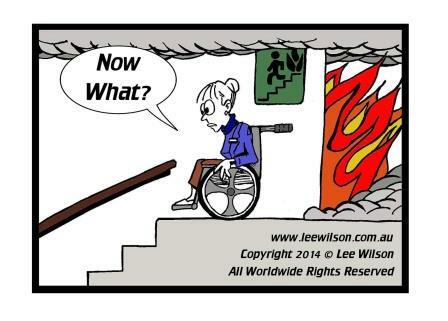 The need for safe evacuation for people with disabilities was recognised in the recent update of Australian Standard (AS) 3745 -2002, Emergency control organization and procedures for buildings, structures and workplaces. That the emergency procedures consider all occupants and visitors who may for any reason require assistance during an emergency. A current list of names, workplaces and other relevant information about occupants with a disability should be kept in the Chief Warden’s control area. Suitable strategies should be discussed with those people with disabilities occupying the building and a Personal Emergency Evacuation Plans (PEEP) is developed for each of the persons. Lee Wilson, MAIPM C.Build E MCABE PEng(UK) MSPE MWOBO, is an accessibility and universal design specialist with an extensive background in access for people with disabilities, building compliance and project management. Lee is an Accredited Member of the Association of Consultants in Access Australia (ACAA) and holds memberships with multiple Australian and International organisations. In early 2018 he was appointed as a Subject Matter Expert in Disability Access by the Australian Building Codes Board. Additionally, he has several undergrad and post-grad qualifications in building surveying, risk, construction management, project management and performance-based building and fire codes.